The Senate voted last night on 4 competing budget plans, and rejected all of them, before heading out of town for the Memorial Day recess. The series of votes gave the American public a preview of the big issues that will dominate next year’s elections, namely, spending cuts and entitlement reform (especially Medicare). The press this morning is focusing on the Senate’s rejection of the House-passed (Ryan) budget 40-57, but they’re being much quieter about the fact that President Obama’s budget was defeated 0-97. 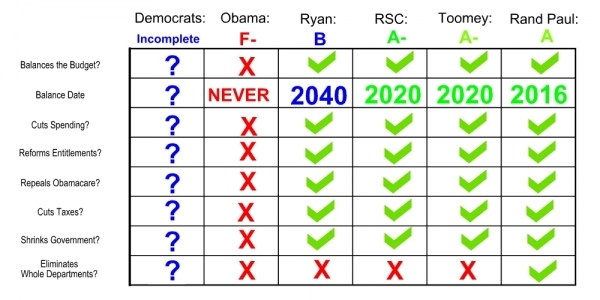 The House Republican plan got 40 votes in the Senate. The President’s plan got zero. Not a single U.S. senator voted in favor of President Obama's budget. This was a plan, remember, that all the top Senate Democrats praised 6 weeks ago. Last night, they all voted against it. It was an absolutely stinging rebuke of a sitting President by a Senate controlled by his own political party. Meanwhile, all of the swing state Republican senators sided with Paul Ryan and the House Republicans. The Obama Budget (failed 0-97) was the biggest loser. It wouldn’t cut spending, reform entitlements, or shrink government, but would raises taxes on the middle class. The Toomey Budget (defeated 42-55) garnered 2 more votes than the House budget, picking up the liberal Murkowski (because it didn’t offer specific entitlement reforms) and the libertarian Paul (because it balances the budget in 10 years instead of 30 years as in the House-passed plan). The Rand Paul Budget (defeated 7-90) was the boldest plan, balancing the budget in just 5 years, and eliminating 4 cabinet departments (HUD, Commerce, Energy, and Education). Voting against it were all Democrats and all but 7 Republicans. The Magnificent Seven were: Tom Coburn (R-OK); Jim DeMint (R-SC); David Vitter (R-LA); Mike Lee (R-UT); Orrin Hatch (R-UT); Rand Paul (R-KY); and Mitch McConnell (R-KY). The battle lines have been drawn. The Republicans have put forward a comprehensive plan to avert national bankruptcy by reducing spending without raising taxes. The Democrats have no plan, except to oppose and demonize Republicans (and the tea party) at every turn. Last night's votes were a temporary setback for budget restraint but a moral victory for the cause of fiscally conservative, constitutionally limited government. To vindicate that cause in 2012, reformers have no choice but to remain bold and defend their principles. A good place to start: Demand that Democrats produce their own budget plan. TAKE ACTION: No Debt Ceiling Hike! Tell Congress to 'Cut, Cap & Balance'! Dean Clancy is Freedomworks’s Legislative Counsel and Vice President, Health Care Policy. We the people have more influence in Congress than we realize. When enough people come to together, Congress must listen or face the consequences at election.No more gavel marches in victory for rushed bills passed without the people's consent. On behalf of FreedomWorks’ activist community, I urge you to contact your senators and urge them to cosponsor the Regulations from the Executive in Need of Scrutiny (REINS) Act, S. 92, if they haven’t already done so. Introduced by Sen. Rand Paul (R-Ky.), the REINS Act would reaffirm the legislative branch’s Article I authority by requiring that economically significant rules be approved through a joint resolution of Congress before they can take effect. College basketball star Len Bias died of a powder cocaine overdose while celebrating his number one draft pick in the 1986 NBA Draft. Because his death was widely, although mistakenly, thought to be due to a crack cocaine overdose, the public and the federal government responded alike -- with panic about the perceived heightened dangers of crack cocaine. This panic served to advance the national war on drugs that was already well underway.